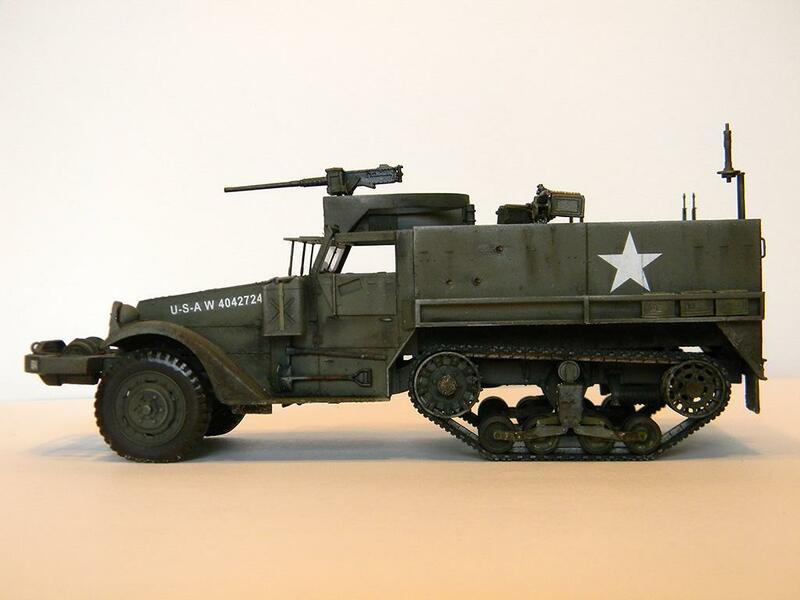 I think pretty much anyone who builds armor wants to build a Half-track at some point and I’m no exception. This is the first Dragon kit I’ve built since getting back into the modeling game and found it pretty darn nice. I built the 3-in-1 kit, so there are plenty of left over parts depending on which configuration of the M3 you decide to build. There are a few tricky steps in final assembly when you marry the front half of the kit to the troop carrier portion, so do some dry fitting to make sure the correct brackets lineup in the correct spots. I know I’m novice, but boy do I hate PE parts. I tried to get the louvered grill built as part of this kit. I mean how cool does it look to have that open—right? But I could not make it look right so mine has the grill closed. 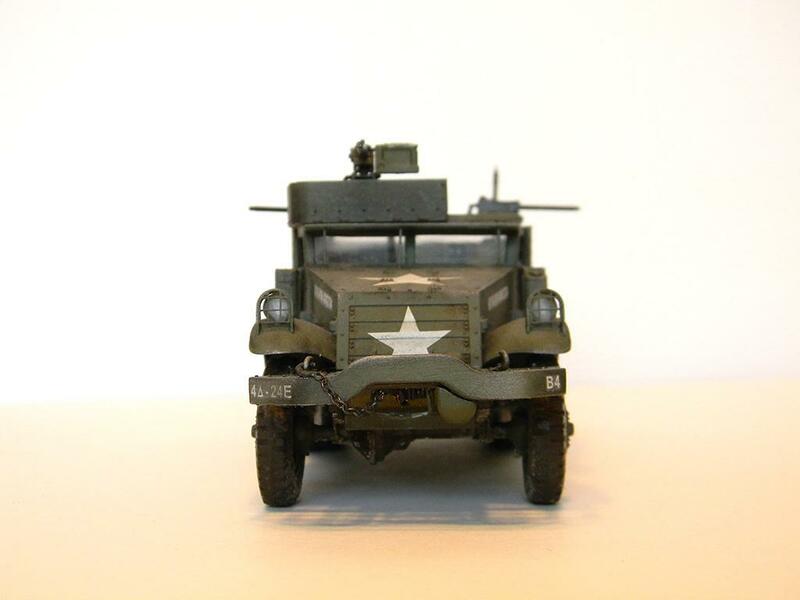 I guess it’s a post Battle of the Bulge, Spring M3 Half-track. Nothing real special about the finishing other than I added a few 20 MM hits in the troop carrier just because I wanted to see how authentic I could make them look. Sorry the photos are a little yellow and dark. I was loosing light as I shot them. I hoping at some point to build a diorama to incorporate this build along with my Deuce and a half. Comment away, keep building gang! Seriously, Matt, novice? I think not. 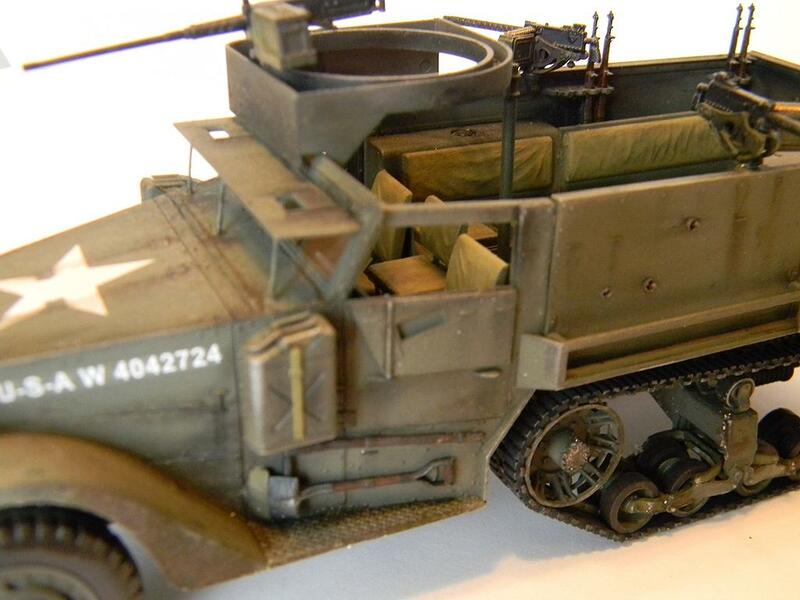 There’s plenty of experienced modelers would be proud of this level of realism and finish. You are right about two things, though. Some better lighting would really show this off as you have a really professional looking background set up (and I say this as the worst model photographer in the known universe). Also, it would certainly make a great dio with your two and a half ton. Excellent halftrack, have a few tanks in the stash, but 1/2 tracks and soft skinned vehicles tend to attract me more than the armor. 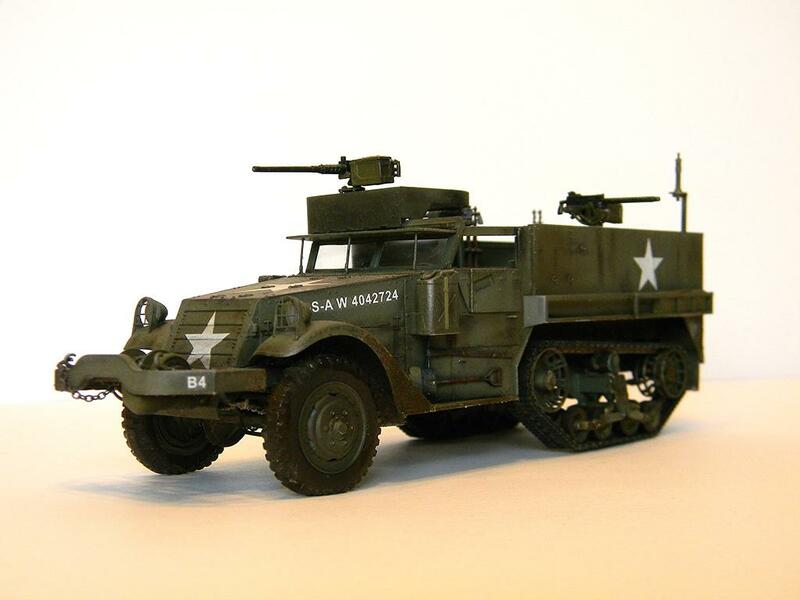 One of the desirable builds is this version of the M3 halftrack. I have the Hanomag as well. The combo of wheel and tracked vehicles really tickle my fancy. But I have to start building a few. The weathering on this is about as good as you can get, so well done on that aspect. Thanks for sharing. No wonder you invite comments11it looks fantastic! museum-level quality and that’s why I agree with David, above, about some sort of diorama-type display. Outstanding work. Most excellent, Matt! I remember putting one together decades ago, and I didn’t like the ‘rubber band’ tracks. Then I found out that the REAL tracks on these are essentially ‘rubber band’ tracks and not like the track I was used to from my old M-48s. M60A1 & A3s, and M1 series tanks! PS – you did really well on the bullet strikes, too. My question is this: since the armor thickness around the crew compartment is somewhat thin, wouldn’t 20 mm Armor Piercing rounds penetrate? I could see where 7.92 AP and even .50 AP would be defeated but I’m not sure about 20 mm. This doesn’t change the fact that this is a GREAT M3! The track on this are rigid plastic which fixes the rbber band effect, but doesn’t allow for any droop of the track. But looking at photos, they don’t drop as much as tank tracks so it’s pretty accurate. Now that you mention it, you’re right. There wasn’t much sag with these tracks. Great half track! Your photos show it off pretty well, I’m the worst model photography, I’m still trying to get consistent image quality. That’s a beauty Matt! Love the weathering and battle damage, and I do have a soft spot for half tracks. It’s what you get when you can’t afford the entire tank! Matt, this is pretty nice, very realistic look, and the battle damage looks great. I’ve got pictures of some 50 cal hits on the side of Sherman used for target practice that look just like this. Well done ! Terry, any chance of you posting some of these. Would be really helpful references and I’d love to see them. Yep, what you said they said. Nicely done Matt, don’t see these very often, not sure why. Turned out exceptionally well, especially like the bullet strikes, well done. Non-tank military vehicles are always attractive in my view, whether purpose built or converted civilian vehicles. 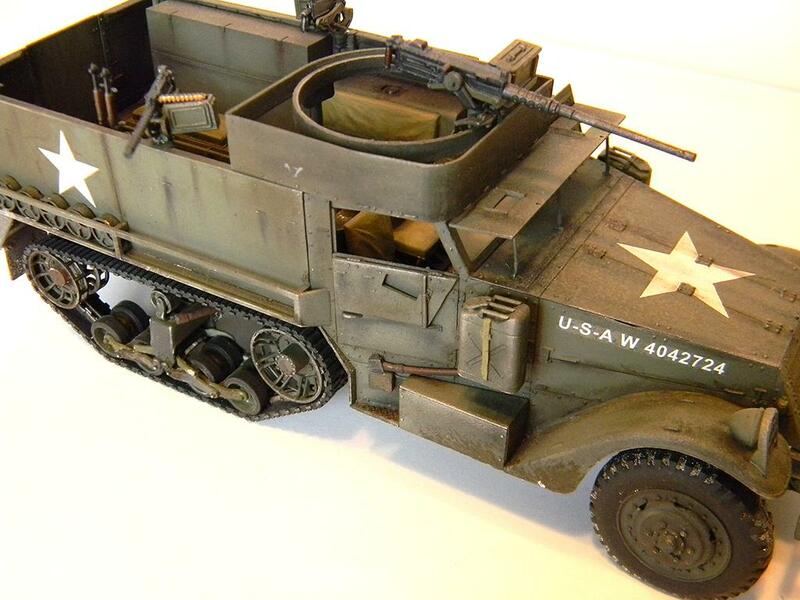 This half-track looks great, nice weathering, and your photographs are fine. 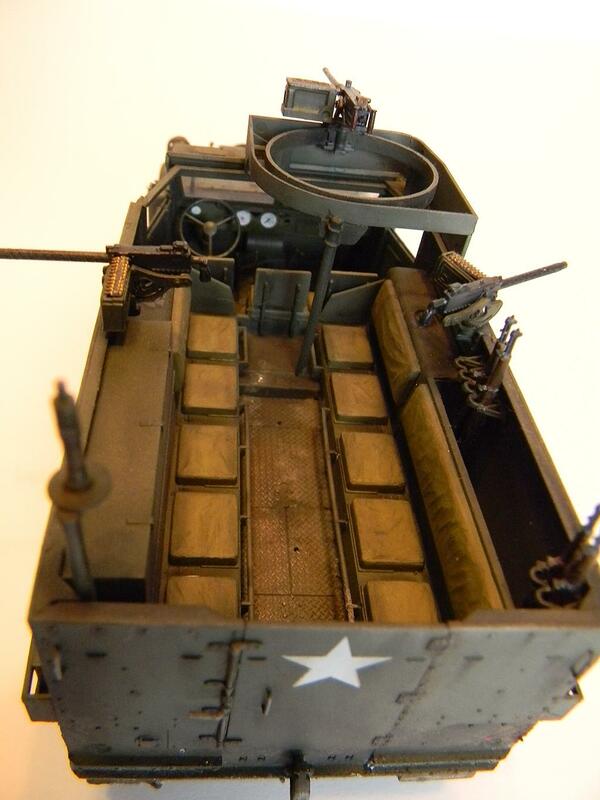 Matt, great halftrack! Grandfather of the APC. Beautifully done! Wish they had a couple of them in 1/48th. Maybe Tamiya, someday. You’re a “novice” and I am the man in the moon. Seriously, that is really nice. Very realistic look overall. It definitely deserves to be part of a diorama. You should also consider it a “Kasserine Pass” entry, since there were plenty of M-3s there. This is absolutely gorgeous. You did an excellent job on this. You have to be really pleased with your work and if you are a novis, I can’t wait to see your builds when you learn how. Halftrack’s have always been a unique vehicle. I have one in my stash and seeing yours I may dig it out. If I may bore you…. 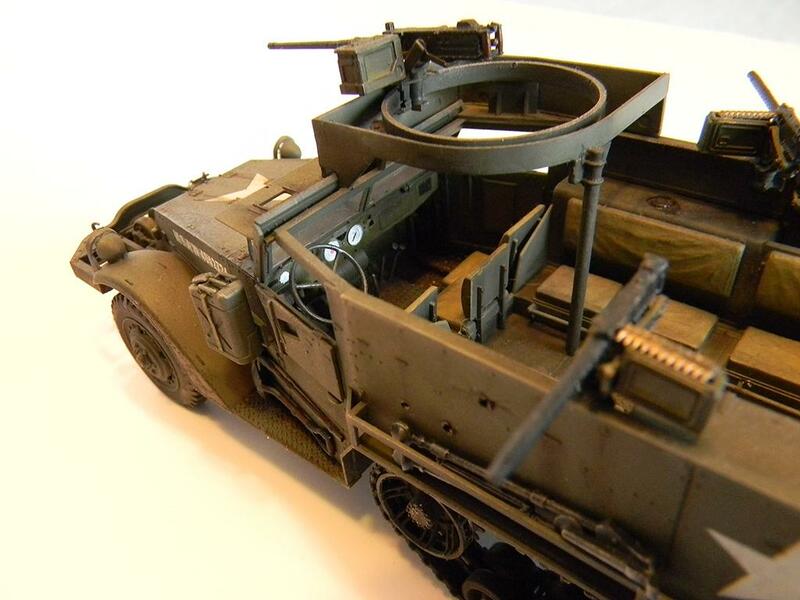 I just repaired a halftrack for a lady. It was a model of her husbands fathers halftrack he drove for Israel during the Six Day War. He treasured it and it sat on a shelf for over 30 years. (Monogram kit) she dropped a plant on ot and really broke it up and parts missing. She wanted it repaired ASAP before her husband saw it missing and broken. It had a command unit in the bed portion. Doing this also stirred my interest in the halftrack. It certainly was no where near as nice as yours. 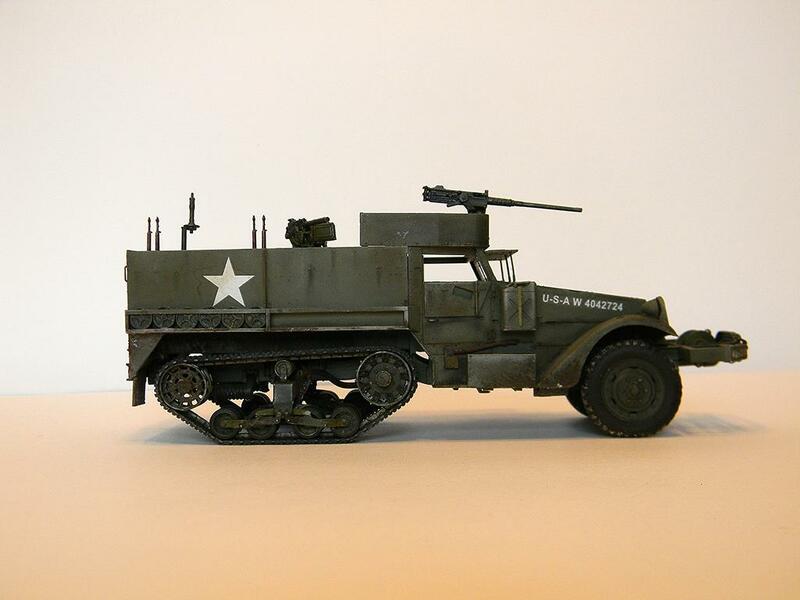 Very nice half-track. A superb job. Frank Williams goes to War!